Capitalizing on its success, Twitter is offering new ways for advertisers to reach its 500 million users. Even though they are still called “water cooler shows”, episodes of the most talked about series are rarely discussed while wasting time at the office. Now people can express their opinions instantly while viewing a show, via social media. And no platform is better suited to this than Twitter. The folks at Twitter have not missed the opportunity this presents. Using the semantic technology of Bluefin Labs, the social TV analytics company they recently acquired, they are offering advertisers the chance to reach viewers of specific shows. Twitter announced this week that they are rolling out a new product that will allow advertisers to send ads directly to users who are watching and tweeting about a specific program. Working on the assumption that, if you are watching a show you have also seen the commercials aired, advertisers are being given the opportunity to then send a message to reinforce the spot to the viewers. Both current viewers and those who have tweeted about the show in the past can be reached. The idea for this service grew out of Neilson studies indicating a strong correlation between TV ratings and tweet volume. Beginning this fall, Neilson will provide a new ranking for shows called the “Neilson Twitter TV ranking.” It will measure the reach of Twitter conversation about specific shows and will give advertisers another tool in deciding where and how to advertise on TV. Twitter also announced a new program called Twitter Amplify, which is a partnership with media outlets such as A&E, Bloomberg, Clear Channel, Discovery, Major League Baseball and the NBA. Desirable content, such as clips from sports games or popular shows, will be tweeted to followers with a short ad at the beginning or end. 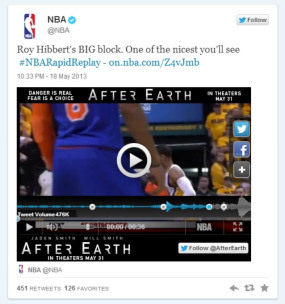 The service was tested last week when the NBA streamed clips on their Twitter feed with ads for the movie After Earth, which will be released this Friday. Although the effectiveness of these new Twitter offerings remains to be seen, the amount of discussion about it in the blogosphere would indicate that there is a definite interest. Advertisers, Twitter and their media partners need to be cautious to not overdo it, though. Too many ads could turn viewers off the product or lead them to unsubscribe to a feed. Ridge Marketing is a full service advertising agency and understands how social media and traditional advertising work together. We can help you craft a plan that delivers.